Early in February Kids Company were drawn out of the hat by Charity Comms as the winner of our annual ‘Unwrap a designer’ competition. This is where we donate a few days of our time to support a charity. 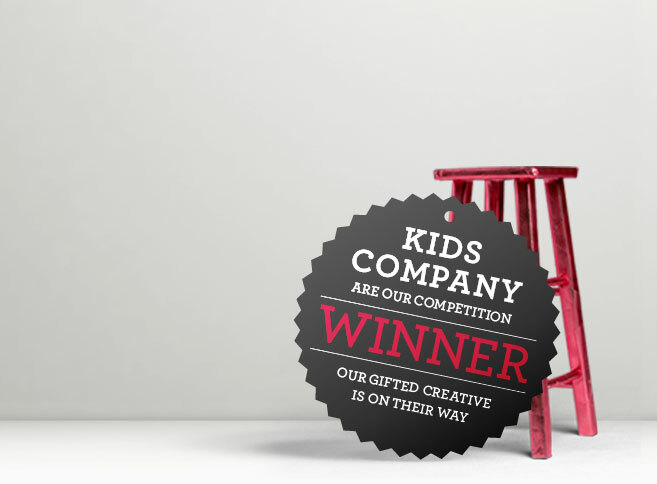 We have now completed our initial work with the Kids Company. The project involved looking at different ways to visually bring the Charity’s positive and truly wonderful stories to life. "The Allotment have been a pleasure to work with. Whilst bringing inspiring and vibrant ideas to this project, they have shown great respect and understanding towards our ethos and have maintained excellent communication throughout." For The Allotment team it was a fantastic and inspiring journey - it was a reminder that we have so much to be grateful for and that children are vulnerable, 'indomitable' and so, so brave. Thank you Kids Company. And thank you for saying these lovely words about The Allotment.